These are one of my favorite cookies! The cookie itself is chewy and moist with a hint of freshness from the orange zest and a sweet, melt-in-your mouth feeling from the white chocolate chips. There is just something about orange and white chocolate together that is irresistible. To prevent myself from eating every last one of these cookies (because, I really would eat every last one), I piled them up and took them to work to share with all of my co-workers! They are always a huge hit! Preheat oven to 350 degrees. Combine flour, baking soda and salt; set aside. In a large bowl, cream together the butter and both sugars until light and fluffy. Add the egg and vanilla and mix until combined. Add the orange zest. Gradually add the flour mixture and beat thoroughly. 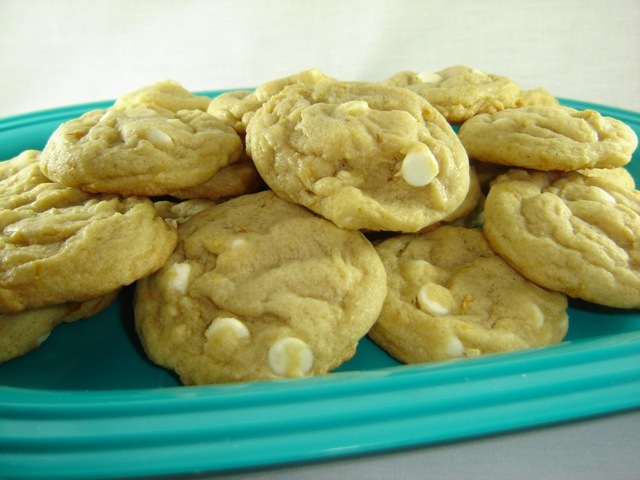 Stir in the white chocolate chips. Using a small ice cream scoop, drop dough onto a lightly greased cookie sheet. Bake 10-11 minutes. Yield: around 30 cookies. These cookies, oh my! 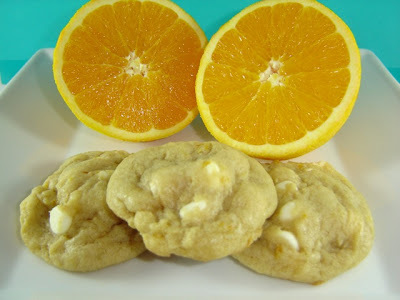 Citrus is my weakness, combined with white chocolate could be dangerous. They look really good. Found you at Sweets for a Saturday. 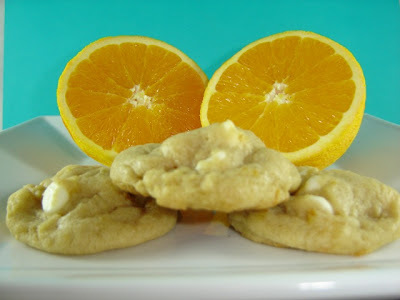 These cookies are definitely going to be added to my "to do" list. I make a similar cookie and it's my favorite. Orange and white chips are the perfect combination. Mmmm...I found your recipe in the "sweet as sugar cookies" blog link. I think this is one that we would love--and your presentation is beautiful. Thanks so much for sharing! This sounds like a great combination! We're putting an orange tree in our yard next week, so I'm definitely saving this one. These look dreamy indeed! 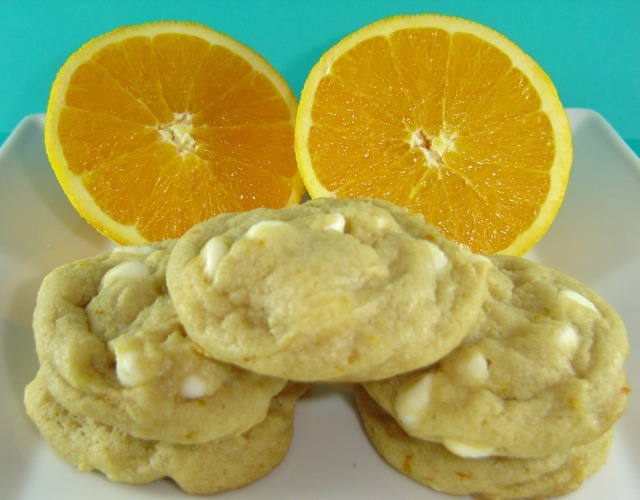 I don't think I have ever tried white chocolate with orange before, it looks like I will soon though - YUM! YUM! These look so soft and delicious! Thanks for your sweet comments on my blog. I can't wait to look through yours some more! Mmm, mmm, mmm is right. Can only imagine how wonderful these cookies taste. I tried this recipe and it is divine! I had to make half with white chocolate and half with milk chocolate but both are really yummy! Hi Jenn, I discovered your blog yesterday when looking to find a copycat recipe for the Texas Roadhouse rolls. I made your recipe and loved the outcome. I am really excited about trying this recipe because I am on dialysis and have some diet restrictions. One being oranges because of the high potassium and two chocolate because of the potassium and phosphorus. 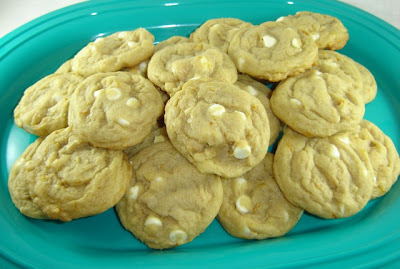 But these are made with such a small amount of the zest and made with white chocolate which is fine. Thanks for the recipe! Can't wait to find more recipes on your blog.